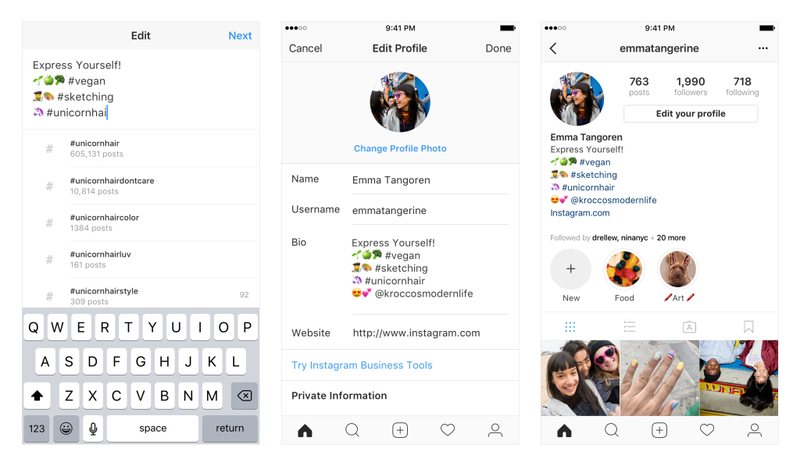 Starting today, profile links and hashtags in Instagram bios will work the way they do elsewhere on the platform: as clickable links. Instagram is billing the functionality as "a new way to express yourself and the things you care about." When you type "#" or "@" in your bio, a list of suggested hashtags and profiles to add will pop up. You've been able to follow hashtags on Instagram since late last year; now, if there's one you're all about, you can let everyone know and give them a convenient way to check it out, right from your profile. You'll be notified if someone tags you in their bio. In case you're not into it, you'll have the option to remove the link (although your account name will stick around as plain text).